When most people think of headshots, they immediately think of headshots for actors and actresses. Headshots are super importants for actors and actresses because it’s one of the primary tools they use to help land good acting gigs. It shows you in your best light and can be the make or break factor that decides whether or not you get a callback. But headshots for personal trainers? Not nearly as popular. But they should be. 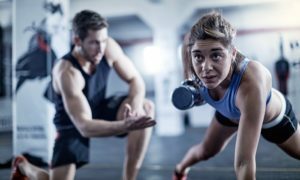 When you’re a personal trainer, you have to sell yourself just as an actor does, especially if you’re offering online personal training programs like those offered by Caliber Fitness. Your photo is a potential client’s first impression of you. You want to look your best and convey confidence, expertise, and friendliness. In other words, you want to come across like the type of person someone would WANT to work with. 1. It makes you look more professional. As a personal trainer, you are essentially running your own business. Whether you’re working for a gym or independently, it’s up to you to get new clients and keep them. That’s why you need to do everything you can to make sure you come across as a fitness professional. The key word here is “professional”. If you take a selfie with your iPhone and post it on the gym bulletin board as your official trainer photo, people are not going to take you as seriously. You need to come across like you’re an experienced pro who has run his or her own fitness business for years. A selfie doesn’t do that. A professional headshot does. 2. It can convey expertise. Though we call them headshots, Ambroja Photography knows that looking the part is an important part of being a personal trainer. People want to work with someone they know can get them results. That’s why we offer a special type of headshot to personal trainers that not only captures your face, but also the top half of your body so that if you want, you can show off those gains you made in the gym. 3. If you do online personal training, it may the the first impression a potential client has of you. These days, online personal training programs are becoming more and more popular. Personal trainers are flocking to Instagram to build up huge audiences of followers who enjoy seeing their workout and nutrition routines on a daily basis. It helps build credibility and shows that not only do you talk the talk, you also walk the walk. If you’re an online personal trainer, then a visit to your website is likely going to be the first impression someone gets about you, and whether or not they want to work with you. As we all know, first impressions are everything. Make it count with a professional headshot. 4. It makes you look warm and approachable. As entertaining as it can be to watch on The Biggest Loser, not everyone wants a Jillian Michaels shouting in their face when they’re trying to get in shape. In fact, most people choose personal trainers who they could also see being their friends. That’s why it’s so important to look warm and approachable in your photo. A smile goes a long way in showing people the type of person you are. You want your picture to say that you care about your clients, that you’re a friendly person who wants to have a positive impact on people’s lives. We can help you capture the perfect shot. During our photo sessions, we take at least 100 photos, and often more than that, so you can choose from a large selection and choose the image you like the best. 5. Your photo can, and should, be used in several places. Don’t think of your headshot as something that is going to be used once and then never again. Remember how I talked about personal training being your own business? Well, all businesses need to market themselves, and personal trainers are no different. Marketing your personal training business should be one of your top priorities. Your image should be everywhere you advertise yourself, whether it’s on your gym’s bulletin board, flyers you hand out, business cards with your contact info on them, your website, on articles you write for blogs or magazines, EVERYWHERE. You want to get your brand as much exposure as possible, and your brand includes your photo so people know who you are. 6. It strengthens your social media presence. I just talked about marketing being such a crucial component of success in your personal training business. A large part of your marketing is going to be done via social media marketing. This means you should clean up your profiles so you don’t have photos of you hanging upside down chugging beer at a frat party. Save those types of photos for your personal Facebook page. What you SHOULD have is a professional page devoted to your personal trainer business. And on this page should be your professionally taken headshot. Use this on your Facebook page, Twitter, Instagram, and wherever else you maintain a social media presence. You also want to make sure to spend some time offering great content to your followers on your social media channels. For a great example of how to do this, check out the Facebook page of Caliber Fitness – Online Personal Training. We did the headshots for several of Caliber’s personal trainers and we were very impressed to see how active their page is, and how engaged their followers are. 7. You make more money. In the end, you chose a career as a personal trainer not only to help people get in shape, but also to make money! Personal training can be a rewarding career for so many reasons both personally and financially. If you’re serious about making real money from your personal training business, you need to treat it and run it like a business. Having a professional headshot is one of the key components of taking your training business seriously and showing the world that you’re a competent fitness professional. If you want to book your professional headshot with one of our Ambroja Photographers, just send an email to Shirley Gillen, our appointment director, at shirley@ambrohaphotography.com. Let Shirley know where you’re located and what you’re looking for, and she will put you in touch with an Ambroja photographer in your area. And keep your eye on this website! We’ll be regularly updating it with tips to help you grow your personal training business as well as examples of the headshots we’re taking of personal trainers all over the country. Welcome to Ambroja Photography! Ambroja Photography specializes in offering the highest quality headshots for personal trainers. If you’re a trainer, you probably already understand the importance of having a professional headshot so you look your best wherever you have to present yourself. Your photo goes on all of your marketing materials, whether it’s your own website, your gym’s trainer directory, fliers, business cards, etc. We’re determined to make sure you look the part and come across as the friendly and experienced personal trainer that you are. Most headshots just focus on the face, but we understand that in the fitness business, you may also want to show off your own body and fitness results in a tasteful and professional manner. We’re experts at helping you do this. Keep an eye on this page as we’ll be updating it soon with more information about our services and how you can book an appointment with Ambroja Photography. Want To Upgrade To A Professional Headshot? Contact us at shirley@ambrojaphotography.com for a consultation to discuss what you’re looking for, and to get in touch with one of our experienced headshot photographers in your area.